Inhabitants of Rhodes are talking about a miracle, having seen on Saturday morning an icon of the Archangel Michael weeping in the Sacred Church of the Archangel Michael in the Old Cemetery of Ialysos. At 2:00 PM Metropolitan Kyrillos of Rhodes went to the place himself where the icon can be found following reports from the faithful, in order to determine if this was a miracle or some other event. The Metropolitan, after indeed verifying there were what looked like tears on the face of the Archangel, asked for the icon to be moved from the place it was hanging. They then examined the back side of the icon as well as the wall on which it rested to determine if there was moisture which passed on to the icon. Having established that this was impossible, the Metropolitan of Rhodes testified that this was in fact a miracle, and he asked that the icon be brought to the Sacred Church of the Dormition of the Theotokos in Ialysos for public veneration, as well as to see if a change in environment would halt the phenomenon. "We will move it to the big church to see how the phenomenon evolves," Metropolitan Kyrillos told the faithful who had gathered in the small chapel. The first to see the icon weeping were women who went on Saturday morning to open the church and who in turn informed the vicar of the church. The vicar, Fr. Apostolos, informs us that the icon was constructed in 1896 and had recently undergone maintenance by the archaeological department. 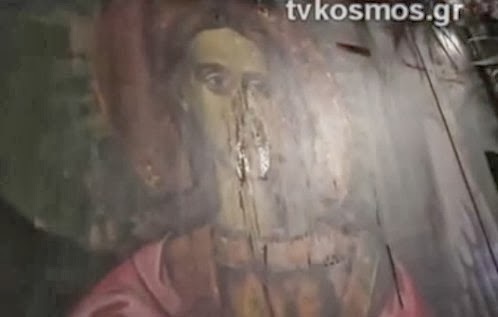 As of today, the icon continues to weep in its new environment, sometimes stopping but then continuing again, and it is even reported that a second icon of the Archangel Michael is weeping from the original church as well. Large crowds have gathered to venerate the icon and have been anointed with the holy myrrh. In the video below, the moment can be seen when the Metropolitan was investigating the icon as well as the testimonials of the residents. For more photos and video, see here.